Well I'll be damned...It's not often that a book spooks me to the point where I actually want to sleep with the lights on. I knew I was creating a recipe for disaster when taking this book to bed with me, but it was just so damn good that I couldn't put it down. 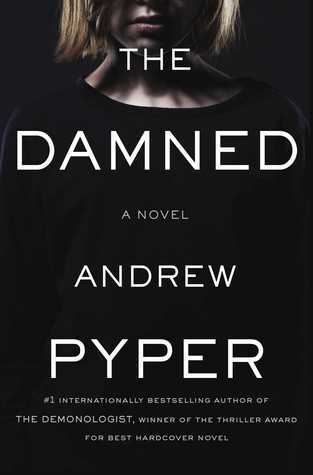 Andrew Pyper made a fan in me when I finished The Demonologist. An equally as terrifying novel. When I had the opportunity to read his newest, I didn't hesitate one instant. Was it horrible of me to have had low expectations? I only had them because I was almost certain he couldn't blow me me away the same way he did with The Demonologist...But I was so very wrong! He blew me away alright, even thought I will now have nightmares until my 30's, it was totally worth it! The Damned wastes no time painting the dark, vivid world of Danny Orchard, his upbringing and relationship with his twin sister. Pyper has proven himself to be an expert on possession. Ashley, a clear sociopath and lacking a soul is one of the creepiest book characters I have come across. She dies(no spoiler, clear in the synopsis) and from then on, torments Danny throughout his adult life. Riveting, terrifying and will have you on the very edge of your seat till the very end. The Damned will keep you up until the wee hours of the morning. Not only from reading, but from being to scared to close your eyes...But like I said, totally worth it! Move over Stephen King, there is a new king of horror emerging! Reading and Blogging Slumps: How to Overcome!